If you frequently embed video clips in your PowerPoint presentations, you’ll absolutely love PowerPoint 2010 since it includes a built-in video editor. 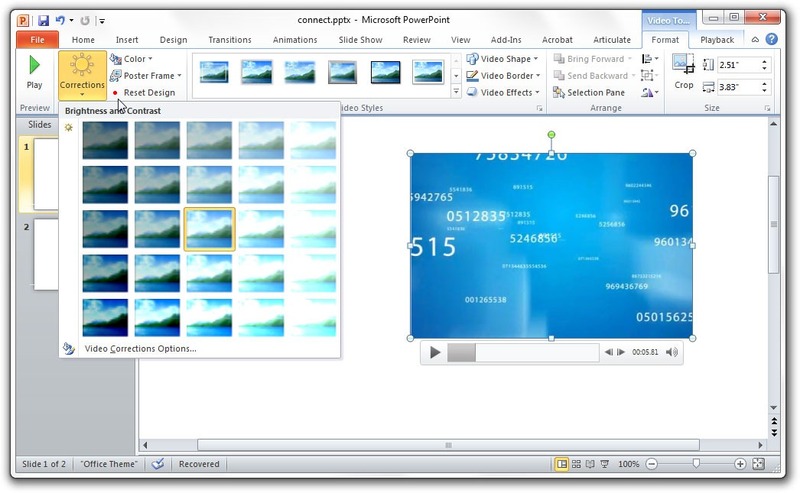 With PowerPoint 2010, you can easily trim unwanted portions of a video clip before inserting it into your presentation. Then you can apply styles like fading edges, 3D rotation, live reflections, etc. to make your videos all the more impressive. You can recolor videos so that they match the color theme of your other slides. There are options to correct the brightness and contrast parameter of a video but what’s more exciting is that you can make this changes visually (see screenshot above). If you want to revert to the original start, just click the "Reset Design" button and it will undo all the video edits.